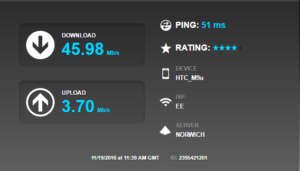 The EE coverage checker image below shows the expected EE 4G signal strength at this location. As you can clearly see from the image below, there is no EE 4G coverage in the area, yet SimRush was able to find the 4G to deliver the super-quick speed test result below. This entry was posted in Blog, Youcantseeit. Bookmark the permalink.